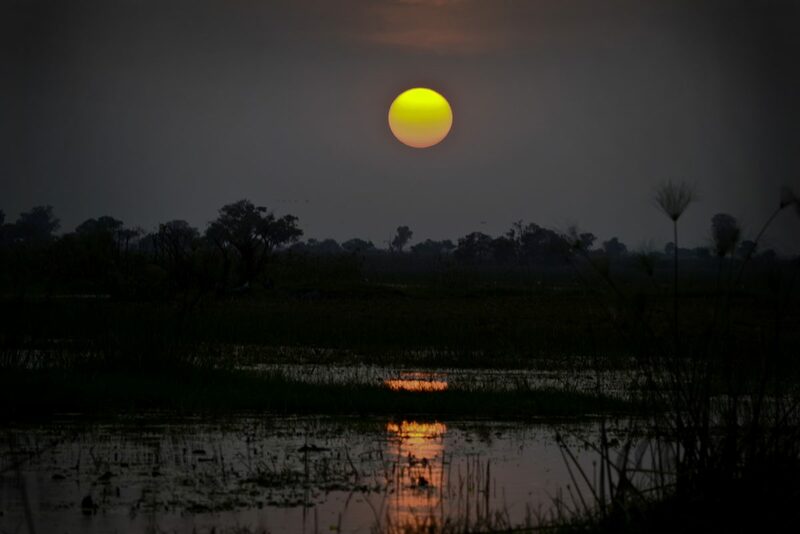 Sunset on the Okavango Delta, Botswana. 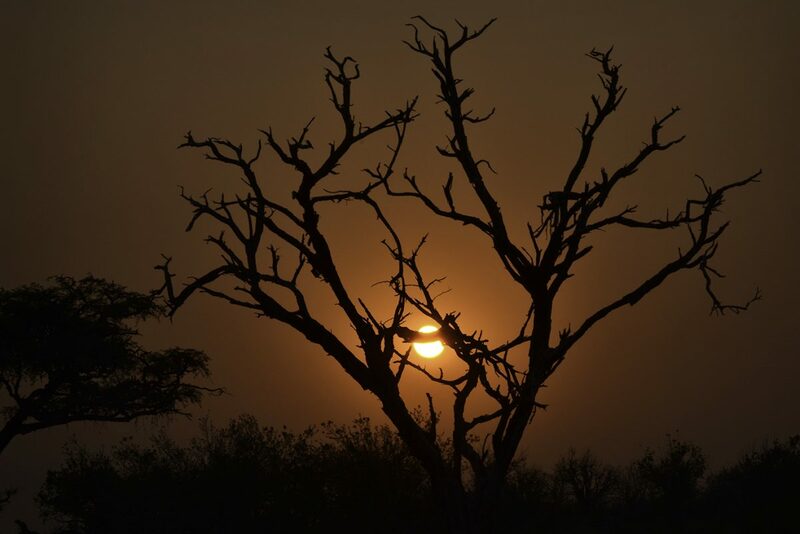 Join SAIIA researchers Romy Chevallier and Ross Harvey as they travel to Botswana to look at successful and sustainable opportunities linked to the country’s beautiful natural resources: its wildlife, parks and conservation areas. View a photo essay of this feature on Facebook. 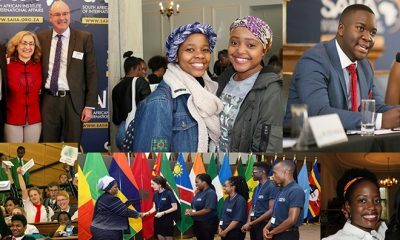 At SAIIA, we have been conducting research work on Botswana for the last two years. According to the available economic, political and governance data, Botswana has outperformed almost every other African nation since its independence in 1965. However, as The Economist noted in 2014, diamond revenues will soon decline, making the need to diversify its economy away from diamonds all the more urgent. And the options are limited. On Monday, 7 September 2015, we departed from an overcast, rainy Cape Town for a cloudless, dusty and hot Gaborone. One of the most pressing development challenges is evidenced in this weather. Locals look despairingly to empty skies, knowing that water scarcity is likely to worsen before it improves. On Thursday, we hosted a dissemination seminar on SAIIA’s work on Botswana, in collaboration with the Southern African Regional Environmental Programme. The event was attended by a number of influential stakeholders, including a representative from the Ministry of Mines, Energy and Water. Ross opened proceedings with a presentation of his research report on options for economic diversification. Tshepo Setlhogile – one of our Botswana partners – presented her work on Botswana’s water governance. With water in the Gaborone Dam at historically low levels, and no sign of rain, the message could not have been more pertinent. Romy closed proceedings by presenting SAIIA’s work on transboundary water governance, which calls for the need to protect the ecologically sensitive Okavango Delta, potentially under threat from large-scale agriculture, damming and mining. Botswana’s options for economic diversification are limited, and tourism will have to anchor the economy until new sources of growth are created. But tourism itself faces significant challenges: one local expert we interviewed quipped that ‘the greatest threat to tourism is tourists’, because of the ecological impact they represent. Tourism itself faces significant challenges: one local expert we interviewed quipped that ‘the greatest threat to tourism is tourists’, because of the ecological impact they represent. Moreover, since the Botswana government imposed an indefinite ban on hunting in January 2014, communities that previously relied on the revenues and bush meat generated by hunting may become conduits for poaching. Even if this does not happen, it is inherently important that local communities enjoy the fruits of Botswana’s economic success. In this respect, the Botswana government recently enacted a Community-Based Natural Resource Management (CBNRM) policy. We set out to explore whether this policy is working, and whether best-case examples could be replicated elsewhere in the region. An 11-seater Beechcraft King Air brought us to Maun, where it was a sweltering 37°C on arrival. Maun is one of the world’s busiest airports, with a light aircraft departing or arriving roughly every 30 seconds, transporting tourists and supplies to exclusive lodges within the Okavango Delta, or flying camera-laden visitors to witness this magnificent wilderness from the air. We set off on the road to Shakawe. Parts of the road have been resurfaced, a welcome development. In these remote parts of Botswana, the driver needs the constant assistance of a co-pilot, who has to keep an eye out for wandering donkeys, cattle and goats. Once you turn northwards to Shakawe, the road conditions deteriorate substantially, requiring intensified pothole navigation. In the dusk, we spotted a matriarch elephant approaching from the west. A quick U-turn allowed us to approach the herd as it was crossing the road towards the delta for an evening drink. What a sight! 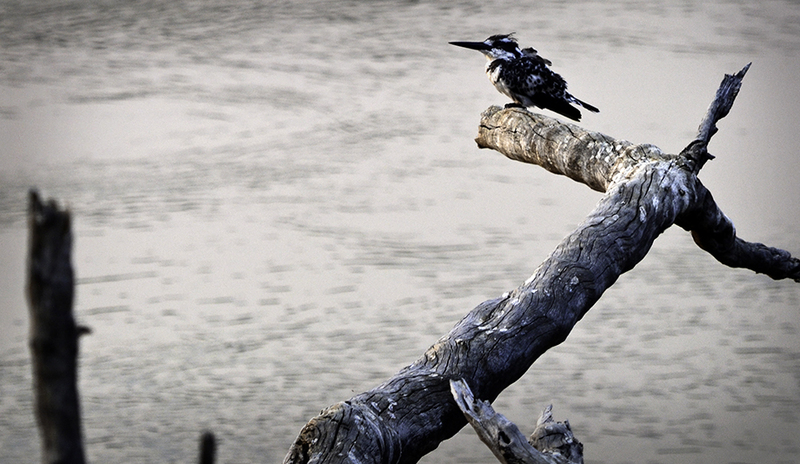 A pied kingfisher on the Okavango Delta, near Shakawe. The increased presence of elephants in this area explains the thorn-laden barricades around livestock kraals and subsistence farmlands, as elephants regularly raid crops farmers have worked long and hard to cultivate. There is often conflict between humans and elephants here, with approximately 15 000 elephants and 15 000 people in the eastern panhandle alone. This is an under-researched field, but Graham McCulloch and Anna Songhurst lead a world-class research station called Eco-Exist. The programme aims to track elephant migratory movements in and out of the Delta panhandle with a view to creating a dedicated corridor to minimise the risk of conflict between humans and elephants. We arrived at our accommodation for the night near Shakawe after a four and a half hour drive. Overlooking the magical ‘panhandle’ of the Okavango Delta, one can appreciate the appeal of leaving the city for this pristine wilderness. The delta is essentially a fan of water splashed out across the dry sands of the Kalahari Basin, a jewel of biodiversity in the middle of a dusty desert. As Frans Lanting famously wrote, it is The Last Eden. Watching the sun rise over the thick papyrus and swirling waters is an experience to savour. The cormorants move in silence, the kingfishers catch some early sun in-between their energetic dives, and the owls find somewhere to sleep after an active night. From the far bank a fish eagle calls out. We arrived in Mbiroba Camp on Saturday, 12 September, planning to pole into the delta by mekoro boat and camp on a nearby island. The Poler’s Trust, which owns and runs Mbiroba Camp, is one of the case examples we had set out to explore. Were the polers benefiting from tourism in an equitable and sustainable way? Despite having booked the trip at the end of July, Mbiroba Camp was not expecting us. 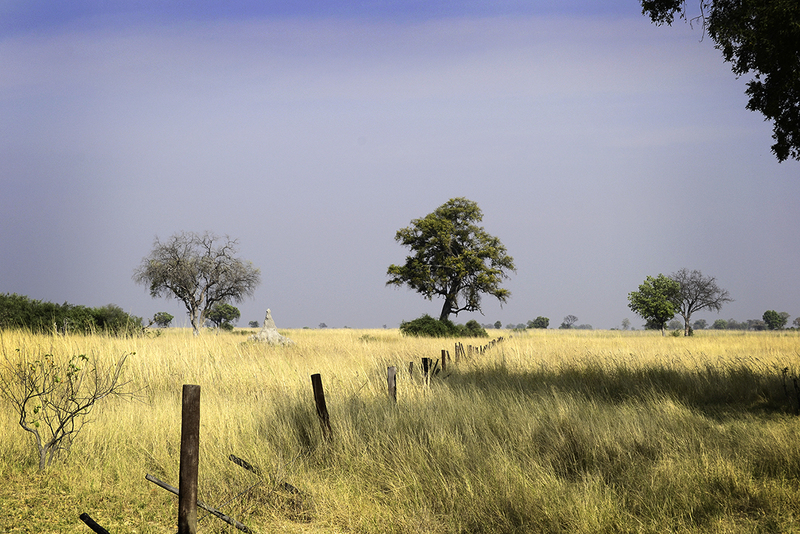 In these remote parts of Botswana, immense difficulties prevail in trying to operate a business. Cellphone reception is intermittent at best, and GPRS is only occasionally available. Eventually we found the manager, who quickly organised the trip for us. We loaded up the mekoro (a rather precarious endeavour), our guide unfazed by our suggestions that the load might be too heavy. 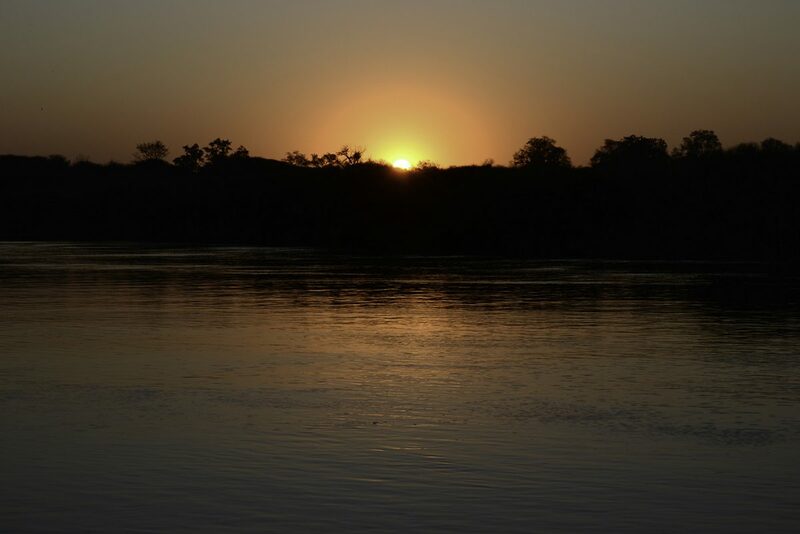 After setting up camp on an island, we headed back out on the mekoro to catch the sunset. Camping in the wild is a phenomenal experience. 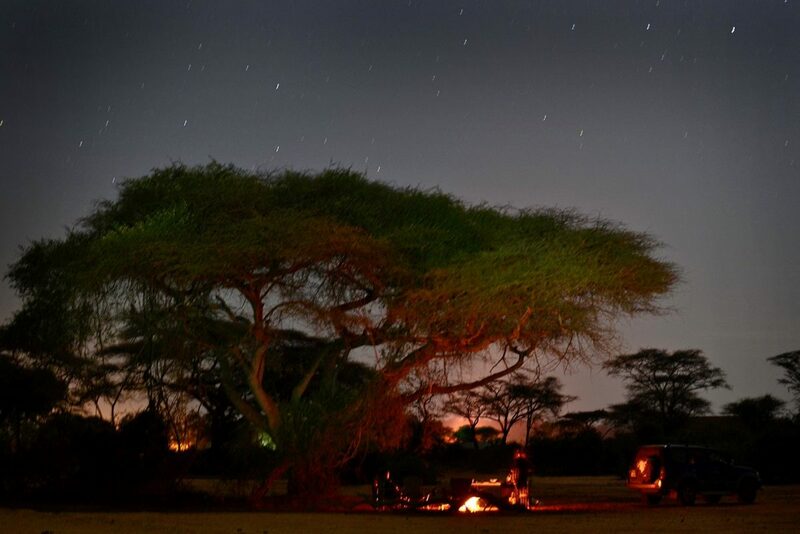 A fire burns all night to dissuade inquisitive lions and hyenas from paying a visit. The toilet is a hole in the ground, too far away from the tents to safely visit in the dead of night. Canvas feels like thin protection, and you sleep with one eye open. Every sound could be a roar, and yet you feel immersed in nature in a very connected way. 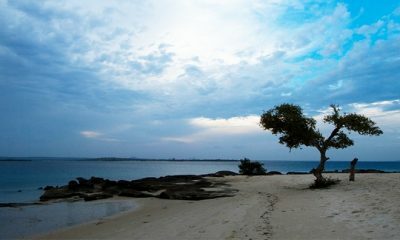 We were up early the next morning for a nature walk on nearby Xau Island. Apart from a few elephants, there was no game to speak of. Unfortunately the wind was against us. Locals hoped that it was blowing in rain; it didn’t. To make matters worse, the dry season was approaching. That evening, however, amid the papyrus in the setting sun, one of the first pelicans arrived in the delta. They migrate here to find water during the dry season. A more splendid flight of fancy one could scarcely imagine. The reason we saw the sunset from a mekoro on the second night was because the truck that came to collect us broke down. A friend of the manager thankfully managed to contact a friend to come and fetch us. Both of the Poler’s Trust’s trucks had broken down in the two days that we were there. They hadn’t been properly maintained. Back at Mbiroba Camp, we interviewed the treasurer and secretary of the Poler’s Trust in an effort to uncover why the business was not performing to its potential. It turned out that the Poler’s Trust, which was established in 1998, had recently (June 2014) entered into a partnership with a private firm, Histrokavango Safari, which would run the camp, renting it from the Poler’s Trust for US$2,000 a month. According to the trust, Histrokavango stopped paying rent after a few months, and so the board eventually decided to terminate the agreement (in August 2015). Upon leaving, Histrokavango allegedly stole the camp’s generator, a water pump and office equipment. Histrokavango is now apparently suing the Trust for US$150,000 in liabilities. Within Histrokavango, two of the partners are alleged to have defrauded the main partner. No recent information about the company exists in the public domain. The Poler’s Trust also alleged that Histrokavango had ‘stolen’ the website domain and now informed potential clients that Mbiroba Camp was no longer operational, proceeding to exploit these clients themselves. The failed relationship reveals a number of underlying dynamics that need to be better understood. SAIIA researcher Romy Chevallier interviewing the secretary of the Okavango Polers Trust, 13 September 2015. First, unusually for Botswana (but highly desirable), the trust requires an annual membership fee of US$7. As minimal as this may be, it creates a level of ownership that would otherwise be absent. However, information asymmetry can create intractable conflict within trusts. For instance, uneducated elders in the trust tend to be suspicious of younger (more educated) board members who argue for funds to be spent on vehicle maintenance or a website. Mbiroba’s website was last updated in 2007, and potential clients have no way of knowing in advance what they will be charged. Second, even the best-educated board members with some numeracy and English language skills lack business skills, and would benefit greatly from further training. There is recognition that partnering with a private firm to run the Mbiroba Camp and market it internationally (with poling as one of the listed, packaged activities) would be optimal, but there is no capacity within the trust to ensure that such a contract would be watertight and that the proposed partner could be trusted. Their experience with Histrokavango has made them dubious about any future partnerships. Third, regular elections are meant to ensure that board members remain accountable. However, in the case of the Poler’s Trust, two board members allegedly went rogue and signed a contract with Histrokavango without informing any of the other board members, let alone the entire community. As far as we could ascertain, they were not held to account in any meaningful way. With well-trained staff and clear package deals on its website, Mbiroba Camp could provide a sustainable source of revenue for the community. the three-star tourist market in the area. Mbiroba is situated right on the edge of the delta and the scenery is magnificent. At present, the polers either work freelance (for other tour operators in the area) or remain unemployed, as demand for their service has declined rapidly in recent years. The lack of a reliablethree-star offering pushes the cost threshold beyond the reach of most tourists who may otherwise consider it a worthwhile destination. Some people we consulted argued that trusts are essentially business-incompatible entities. Conflicts over the distribution of funds invariably arise as a result of mistrust, due in part to the education asymmetries mentioned above. Regular elections also hinder continuity in terms of executing a business plan and taking difficult long-term decisions. It is hard to argue with this view. From Seronga, we returned to Shakawe on Monday, 14 September to visit the Tsodilo Hills World Heritage Site. 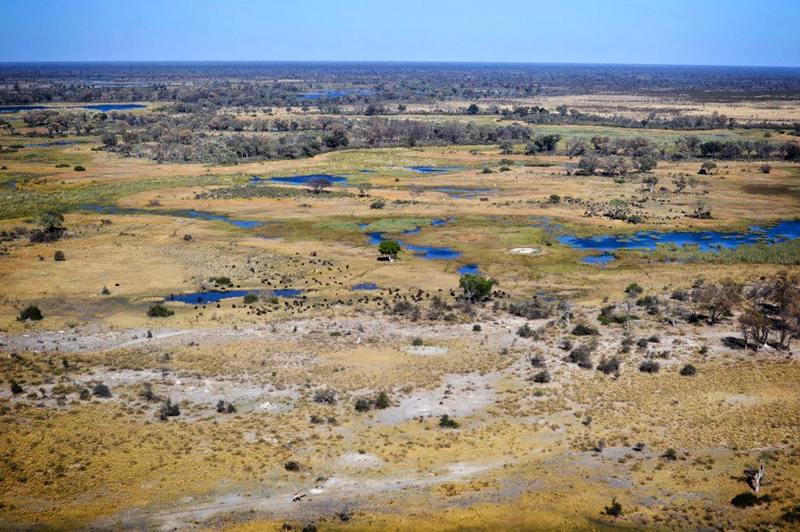 This is one of Botswana’s two registered world heritage sites (the Okavango Delta being the other, more recent addition). Our guide on the rhino walk was knowledgeable and explained to us how the community trust operates. The heritage site itself is managed by the Department of Wildlife and Parks, but employs members of the local community. The board consists of 10 members, who decide how revenue – generated by the community campsite and gate entrance fees – will be distributed. Tour guides keep the walking fees (about US$12 per person for the least expensive two-hour walk). A major part of the attraction, aside from the walking trail options, which are beautiful in themselves, is the series of bushman paintings that date back a few hundred years. It is a marvel that this mix of blood, ochre and urine can stain a rock indelibly for hundreds of years. Back at our accommodation that evening, we met Prof. Amanda Stronza, a co-director of Eco-Exist from Austin, Texas, and discussed some of the things we’d witnessed and what the alternatives might be. There is near-consensus that communities must benefit more from tourism, but how that might best happen remains elusive. The following morning (Wednesday, 16 September) we drove back to Maun, organising meetings while driving. Once in the city, we met Botswana’s rhino co-ordinator and environmental sustainability director at one of the biggest tourism companies in the country. He is in charge of the rhino translocation project (transferring endangered rhinos from South Africa to a secret location in Botswana), and we wanted to find out whether the recently imposed hunting ban was having as deleterious an effect as many allege. The argument typically runs along these lines: the sudden ban has left communities without access to revenue streams and bushmeat – two crucial components of livelihood sustainability for the rural Batswana. Replacing hunting with photographic safaris (moving from consumptive to non-consumptive tourism) is not a simple matter, with at least two difficulties. First, not all hunting concessions are aesthetically equal. Some are suitable for photographic safaris while others are not. For example, two concessions to the east of the delta (near Zimbabwe) are now unoccupied, raising the risk that this land will either be lost to wildlife and biodiversity preservation through a reversion to livestock farming, or be used by poachers. One of the people we interviewed suggested that it would be worth considering land-use models that allowed for livestock and wildlife co-existence. Second, the downside risk is that although there is a ‘high-value, low-impact’ policy in place, the lost hunting revenue – especially as far as it accrued to communities – may never be replaced by photographic tourism. Photography tourists also stay for longer, resulting in a greater impact on sensitive areas. An article in the New York Times presents some of these arguments, and the retort in National Geographic is even more illuminating. Botswana’s rhino co-ordinator provided some useful insights not typically covered in these types of media engagements. Apparently President Ian Khama was convinced by a 2012 survey that wildlife numbers were dropping, and that hunting was not having the desired conservation effect that many of its proponents argue it can have (if well-managed). Others dispute the methodology by which those numbers were derived – it is difficult to control for cross-border migration, for instance. Even if it was the right conservation decision to ban hunting, the way in which the ban was implemented has generated complex challenges. Either way, our interviewee argued that if wildlife numbers started to improve now it could be attributable to the ban, and the president would be praised for bold leadership. He also noted that, regardless of one’s position, one had to respect the president for taking a stand based on conviction, something that has raised the ire of neighbouring presidents. However, community members are frustrated that they now have to serve tables instead of being able to track and skin for hunters. Moreover, the bushmeat from hunting would sustain communities for the six months of the off-season. Now those community members who can find jobs in photographic tourism have to work all year round, often for less money and no meat. Having said that, many conservation stakeholders claim that hunters did not uniformly abide by the rules, often violating their quota restrictions and channelling revenue out of Botswana. Also, skinning and tracking provide relatively few direct employment opportunities. Even if it was the right conservation decision to ban hunting, the way in which the ban was implemented has generated complex challenges. From our next meeting, with the CEO of the biggest tourism operator in the delta, it seems that the Community-Based Natural Resource Management (CBNRM) policy is not working effectively either, for a number of reasons explained below. Typically, the Community-Based Natural Resource Management (CBNRM) model involves some kind of joint venture between a private tour operator and the local community trust. The board of the trust, voted in by community members every three years, makes budget allocation decisions for whatever it deems to be the priority requirements. The budget is generated by the rents charged to the joint venture partner for sub-leasing the land concessions, which the trust obtains from the relevant land board. 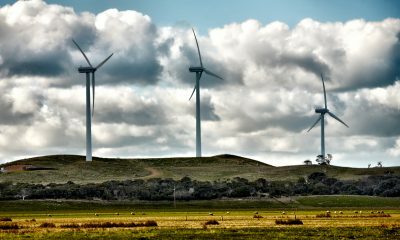 Community trusts can obtain 50-year leases from the land boards, which they sub-lease on a renewable contract, often for periods of 20 years. Recently, the Botswana Tourism Organisation (BTO), a parastatal, has become a third party that is meant to ensure that community trusts allocate money more efficiently and towards productive ends. In other words, the revenue that used to go to straight to the community trust is now channelled through the BTO. Sunset over the Okavango Delta near Xau Island. Aside from the complexity of this arrangement, there is a substantial expectation gap. Local community members expect extensive employment opportunities at the various partner lodges, in addition to rapid upward mobility within those jobs. Community trusts complain that community members are only employed in menial jobs and that there aren’t plans in place to ensure that those people eventually become lodge managers. There is also an expectation that, after the initial 20-year lease expires, the community trust itself will operate the lodge. Private tour operators tend to see this as an unreasonable expectation, compounded by the lack of suitably trained and educated community members available for such high-value lodges (which charge between US$1,000 and US$1,800 per person per night). Skills invariably have to be imported from elsewhere. 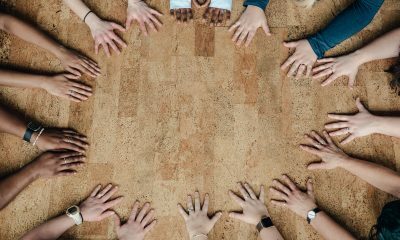 In addition to the rents accruing to community trusts, private partners contribute corporate social responsibility revenues to community trusts. Private operators want more influence over how these rents are allocated. Moreover, the particular CEO we interviewed expressed frustration with the fact that board members of the community trust were often the very same people whose employment at one of the lodges had to be terminated due to theft, incompetence or drunkenness on site. 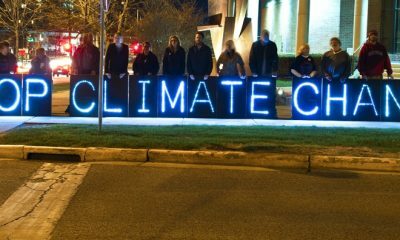 These community members often actively sow negative sentiment towards the private partners. On Thursday, 17 September, we had to run to catch our plane to Kasane, a wilderness wonderland on the confluence of Botswana’s borders with Zambia and Zimbabwe. Chobe National Park dropped its fences a number of years ago, and there is also no fence along the Zimbabwean border. Driving slowly is advised, given the huge volumes of wildlife that move through the area. We collected some supplies from the local shops (though it must be noted that it is impossible to find a coffee plunger in Kasane) and headed out to Senyati Safari Camp, our accommodation for the week. Senyati is in the Kazungula Forest Reserve, on the Zimbabwean border, about 25km east of the entrance to Chobe. 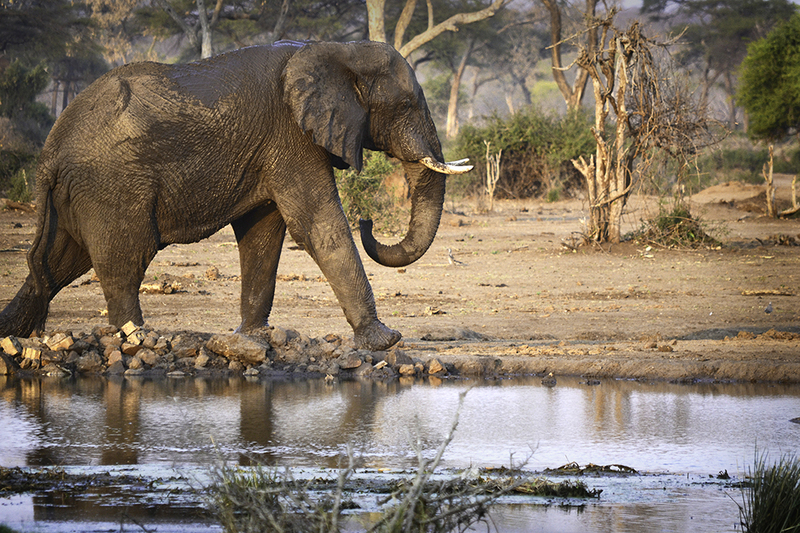 Senyati boasts two waterholes, borehole-fed, which quench the thirst of hundreds of elephants a day and the occasional buffalo herd. Our self-catering chalet bordered the second hole; the main lodge and bar area oversee the main hole. It is a sight to behold. 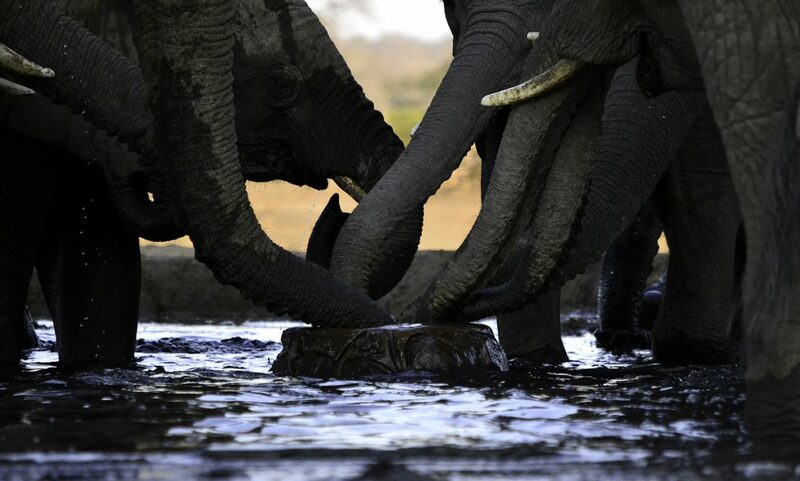 One can scarcely imagine the phenomenal interplay between and within elephant families. Neither can one imagine how these magnificent creatures could be subject to extensive poaching. Data indicates a decline of nearly 30 000 per year for the last five years across Africa, a rate far above the replacement rate, putting the minimum viable population at risk. Botswana, a relative safe haven, is home to nearly 200 000 free-roaming elephants, about half of the continent’s remaining beasts. We met executives from the Kavango Zambezi (KAZA) transfrontier conservation area on the morning of Saturday 19 September, which proved a fascinating insight into regional dynamics, which show how complex tourism and wildlife management in sub-Saharan Africa actually is. KAZA covers Angola, Namibia, Botswana, Zambia and Zimbabwe, and is the product of a partnership with Peace Parks and the World Wide Fund for Nature (WWF). Some of the more successful CBNRM projects, according to KAZA executives, exist in Zambia, and analysts are convinced that this is because traditional chiefs are essentially crowded out in the process – they can’t act as community gatekeepers, as they do elsewhere, such as in South Africa. A fundamental difficulty now, with the cross-border migration of many species, is that the animals do not ‘belong’ to one country or another. But the regional politics are complicated. Namibia and Zimbabwe, for instance, want to be allowed to continue hunting and to retain their elephants’ Convention on International Trade in Endangered Species (CITES) Appendix II listing. This means that if CITES were to allow another one-off sale of ivory, these countries would be able to sell their ivory. A fundamental difficulty now, though, with the cross-border migration of many species, is that the animals do not ‘belong’ to one country or another. Namibia, much to the chagrin of Botswana, continues to allow hunting all year round, and KAZA is frustrated that this is not sufficiently well regulated. Another interviewee told us that a hunter on the Namibian side of the Chobe River gunned down an elephant in front of tourist boats that were cruising the river on the Botswana side. As we enjoyed a boat cruise down the Chobe River that afternoon, we kept imagining what it must have been like to witness something like that. The cruise was extraordinary. At US$29 per person, it is money well spent. 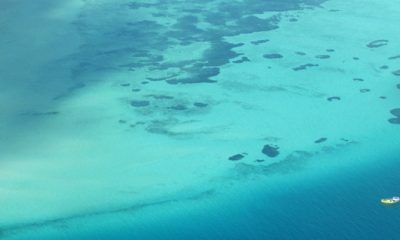 Sedudu Island, the subject of a territorial dispute between Namibia and Botswana in the 1990s, was in 2002 ruled by an international court to belong to Botswana. The island is teeming with game. Endless herds of elephant and buffalo roam its fertile plains. Because lions generally don’t venture onto the island, it is also a haven for all manner of antelope. The risk, of course, is the occasional trek back to the mainland through the crocodile-infested water. 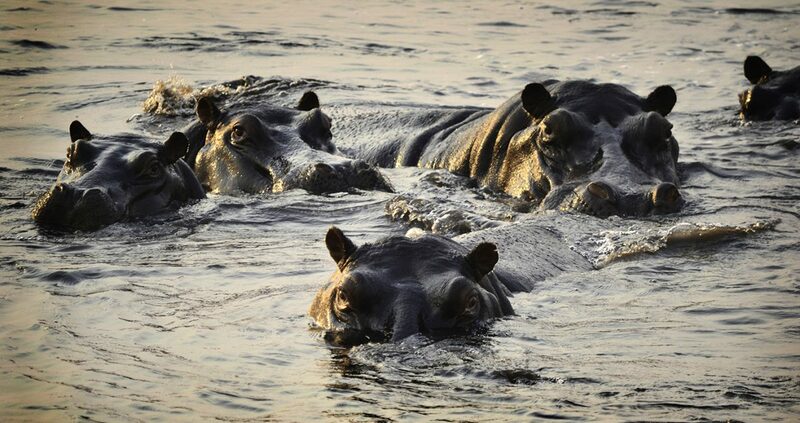 A family of hippopotamuses on Sedudu Island let the tourists know that this is their territory. We spent most of the Sunday in Chobe National Park, for which a 4×4 is required. Within half an hour of being in the park we spotted a wild dog, which then ran past our car, within inches of us. It made the entire trip worthwhile just to see this incredible animal. We were also treated to an extraordinary sight later in the morning – the aftermath of a lion kill. 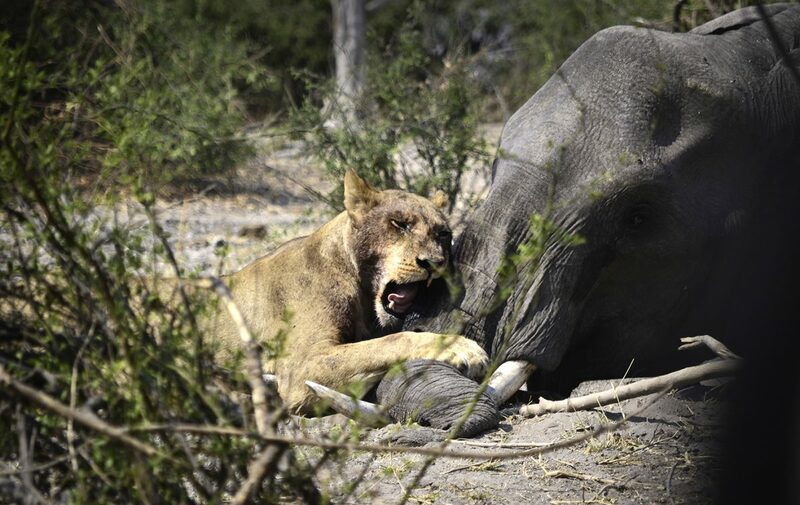 A pride had brought down an elephant, which is not a common occurrence. This lioness could scarcely contain her delight at the prize, Chobe National Park. 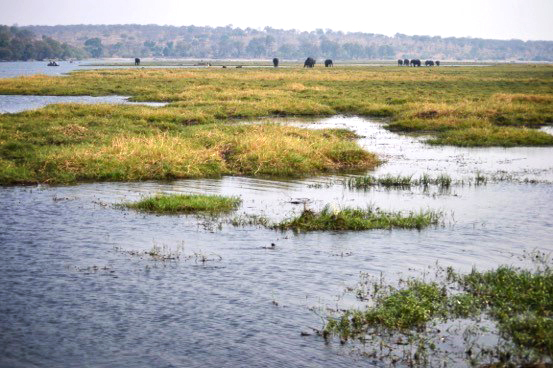 To the west of Chobe National Park, encompassing Mabele, Kavimba, Kachikau, Satau and Parakarungu, is the Chobe Enclave. The Chobe Enclave Conservation Trust (CECT) is the local community trust that works in partnership with a private operator, which has one private lodge on the border of the park. We met the CECT’s chairperson and former chairperson in Kasane, along with the secretary. The CECT is Botswana’s oldest community trust, established in 1993, and it boasts an impressive leadership. Of all the boards we met in Botswana, these board members had the most clearly articulated views about what could be done to ensure villagers’ access to economic opportunities. They began our meeting by articulating their protest at the way in which the hunting ban was imposed. According to their books, the total revenue that used to accrue from consumptive and non-consumptive tourism combined was US$550,000 a year. That amount has decreased to US$250,000 a year through having to rely on non-consumptive tourism alone. The partnership with the Africa Albida Group (which runs Ngoma Lodge) is a sub-lease arrangement of 20 years on a portion of the CECT’s concession, for which it possesses a 50-year lease. Their vision was to have a local manager in place by the end of the 20-year sub-lease. Currently a community staff member is shadowing the manager to ensure that this handover can occur. The trust also expressed the hope that it would operate the lodge by that time (the point at which it becomes the sole owner of the infrastructure). It provided 50% of the upfront capital for the lodge to be built, and is currently paid rent of 6% of Ngoma’s annual revenue. It is difficult to know if this is a fair deal without the full annual financial statements being provided. Also, the mechanism by which the transfer would take place is not clear. For instance, it is not clear whether Ngoma would be sold to the trust as a going concern, or simply handed over. In the final analysis, Botswana is an extraordinary country to visit. Unfortunately, despite being a relatively wealthy country, the distribution of wealth remains highly unequal. Access to economic opportunities appears limited, through a sheer shortage of new sources of economic growth, combined with poor educational outcomes. The government will have to ensure that investments in human capital yield more productive results, especially to produce young entrepreneurs. Community-Based Natural Resource Management (CBNRM) should not be the only means on which communities rely to benefit from tourism and other natural resource-based products. As mentioned above, the downside risk of the policy is that it may inadvertently create animosity between private operators and community members. Wildlife conservation will suffer if this is the case. As long as the local Batswana perceive that they are not benefiting equitably from the tourism benefits of wildlife preservation, they are susceptible either to killing animals that jeopardise their livelihoods or to facilitating poaching. If CBNRM is to work, a new approach needs to be devised that addresses some of the difficulties outlined above. In any event, it should be complemented with an emphasis on training entrepreneurs to take advantage of the business opportunities associated with natural resources. On our last night in the country, a few locals we had met invited us to a braai on a plain above the Senyati watering hole. Enjoying our last night with an open fire, Senyati Safari Camp. As we enjoyed the local rib-eye steak, perfectly grilled on an open fire beneath the vast expanse of the Milky Way, we were truly appreciative of one of the last great wilderness areas on earth. Habitat loss is an increasing threat to this area, and we in SAIIA’s Governance of Africa’s Resources Programme will continue to do our utmost to find suitable policy solutions to the myriad challenges.